Silver Swans ballet is 4 today. 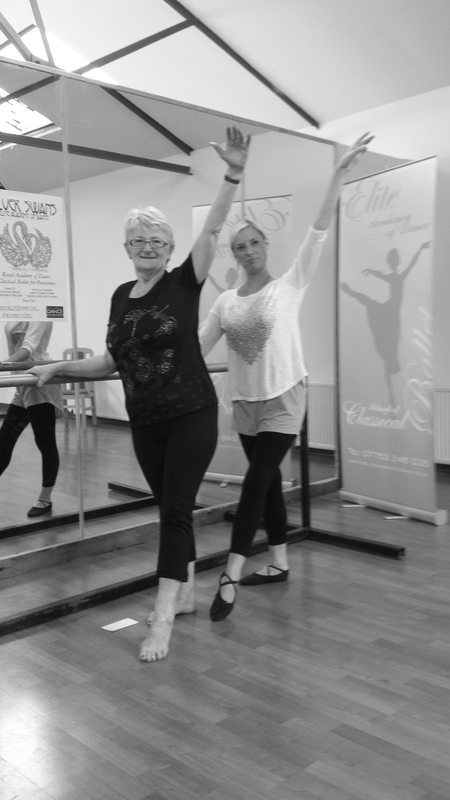 On the 11trh November 2013, Elite Academy of Dance started its first Silver Swans Ballet class for our over 55s. It followed on from a pilot scheme run by Scottish Ballet. The classes were designed to be fun while teaching Ballet at the same time. Added benefits from the classes were keeping fit, improving flexibility, stamina and the fun and friendship that came along with being part of our Silver Swans Ballet Classes. Our Swans came from all different backgrounds, some had never danced before. However under the guidance of RAD Teacher Julie Gunn the group and classes have developed and totally integrated in to the whole school. They have been a joy to teach and Elite Academy od Dance is really lucky to have such a great group as part of our ballet world in Greenock. Silver Swans Ballet Tuesday and Thursday mornings. The Silver Swans Ballet classes are held on Tuesday and Thursday mornings. Starting at 11.00am the classes last an hour. Each class is totally ballet based, with everyone encouraging each other. New students soon get into the classes and pick up the moves and terminology. On a Tuesday we go from our babies who are as young as 2 at 10 am. Then right on to our Swans, who are in 50s,60s,70s and 80s. Its great to see the love of Ballet from all the age groups we teach at Elite Academy of Dance. Its not just about the ballet at silver swans. The ladies do enjoy the chance to socialise with each other after class with their well earned tea or coffee after class. They also enjoy their annual yearly lunch which takes place every November to mark the start of classes in 2013. Finally Silver Swans Ballet in Greenock has been a fantastic success and we would welcome anyone who is interested in keeping fit or has an interest in Ballet to get in touch, we guarantee you will love it.